Omnidirectional, horizontally polarised waveguide antenna for the 3cm band that can be used for ATV or beacon operation. This is not the beginners project as it requires some special machining tools, or CNC equipment . 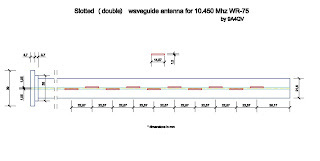 On the other side the software and calculations can be useful for the lower band antennas (23cm or 13cm) where hand-tool can be used to fabricate waveguide antenna. All calculations are done using the HLSSA software running properly also in the DOS window. 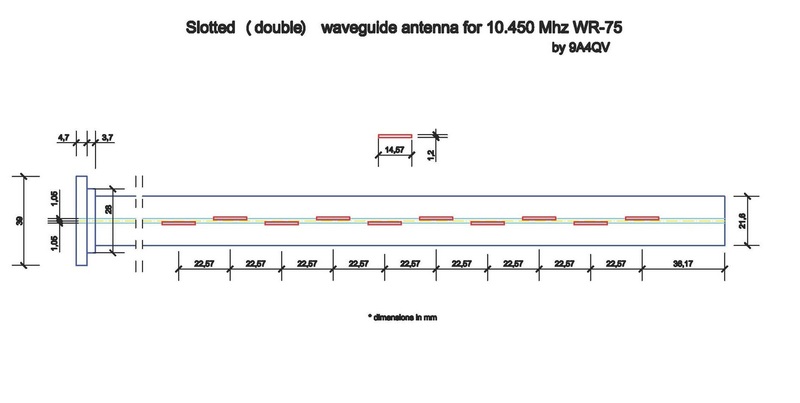 Using the WR-75 size waveguide, 10 slot per side with the central frequency of 10.450 MHz, gain of 12 dBi was calculated. Actual antenna dimensions are then modified to meet the calculated ones. The calculated distance Slot-Short (Lwg/4) was 11.29 mm, but I prefer to use 3 x Lwg/4 and adding the 2.3 mm length for the short-end cap give us a total length of 36.17 mm. If the short-end tuning is required, it is easy to insert the sliding short-end peace when you are using 3 x Lwg/4 length. With only Lwg/4 length, there is not so much room for tuning the antenna for the best RL. For easy tuning and troubleshooting there is no coaxial to waveguide transition on the antenna. Instead, the WR-75 size flange was attached. To test or measure and tune the RL/SWR of the antenna the commercial or previously checked and measured coax to waveguide transition should be used not to affect the RL of the antenna itself. If you are planing to use the antenna indoor or on the location protected from the rain fall or snow than no radom is required. If you are planing to use the antenna positioned outside, on the mast, than good microwave radom should be used to protect the antenna from the watter but also from the bugs that just like to settle inside the waveguide. The radom should be at least 6cm in diameter not to degrade the basic antenna characteristics. Do not use the heat shrink tubing or similar ideas other then microwave radom. Anything in the near field region of the antenna can spoil the gain, diagram and overall characteristics. If you are constrained to use this kind of antenna protection, than insure that the same is inserted in the HLSSA program during the antenna designing. The last attached photo can give you some idea how to install the antenna without radom. When installing the antenna, pay attention to position the antenna vertically. 3dB vertical beamwidth is quite narrow !! More slots will give you more gain but the vertical beamwidth will be narrower. If your antenna is positioned very high , on the hill comparing to the close stations, the close stations may suffer the narrow bandwith problem. If the antenna is slanted, this problem will affect some users even more. Another fact is that the omnidirectional diagram is not the perfect, to be honest, far away from the perfect becoming more like cross diagram with the regions with the difference of 3dB comparing to the maximum antenna gain. So if you want to cover your preferred areas, turning the antenna can give you sometimes even 3 dB more gain. This problem can be solved by using the "wings" attached to the antenna, already published on the web.